The amazing lily-trotter: Jacanas are colorful water birds with long legs and incredibly long toes and claws. 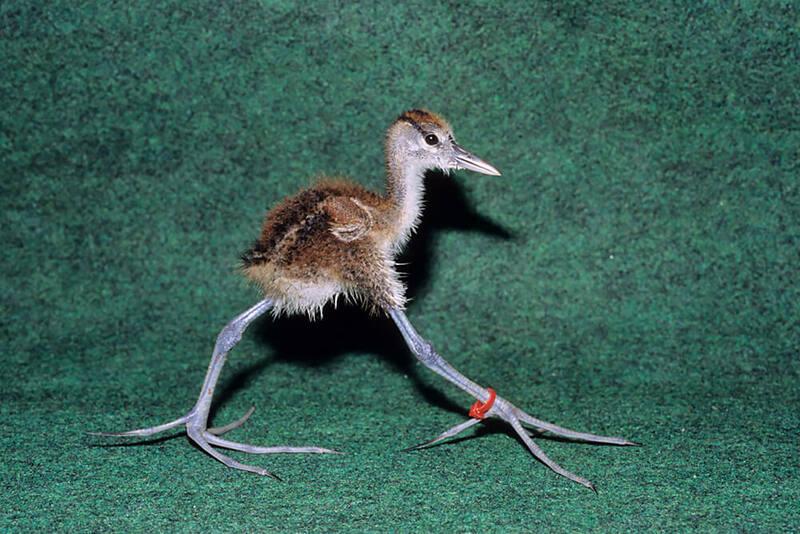 The super-long toes spread the bird’s weight over a large area. This allows them to walk across floating vegetation, especially lily pads. Jacanas often appear to be walking on the water itself! They are also good swimmers and divers, and can journey through open water from one area of vegetation to another. Some jacana species, such as the northern jacana and the wattled jacana, have a chestnut- to cinnamon-colored body, with yellow to greenish-yellow flight feathers, a dark brown or black neck and head, and a yellow bill. The African jacana also has a chestnut body, but its neck and head are white in front and black in back, with a golden-yellow breast. The Madagascar jacana has the same colors as the African jacana, but with the neck and head colors exactly reversed. There is even a pheasant-tailed jacana with (what else!) a long tail like a pheasant. Female jacanas are generally larger than the males. Lily pads and other floating vegetation in swamps, shallow lakes, marshes, and lagoons are home to jacanas. They are native to Asia, Africa, Australia, and the Americas. Jacanas live out much of their lives on these floating islands, foraging for fish and insects, and building their nests. These water birds often send out noisy alarms when they think predators are near. Jacanas are weak fliers and usually only fly for short distances. Some species, such as the African jacana, molt all their wing feathers at the same time and are unable to fly until new feathers grow in. Jacanas spend a lot of time keeping those feathers clean, an important job for water birds. Clean feathers help keep the birds light and warm. If threatened, jacana chicks, as well as adults, stay underwater for long periods with only the tip of their bill above water. They can also swim underwater to avoid predators. Wattled jacanas have a sharp spur on the elbow of each wing for defense. Jacana predators include birds of prey, otters, large fish and turtles, crocodilians, and water snakes. Life can be dangerous in the wetlands! Most jacana species have a frontal shield, which is a bare, fleshy area that extends from the bill to as far as the top of the head. Most of these shields are red, but the African and Madagascar jacanas have a bright blue shield. The blue color may reflect light or allow the bird to blend in with the water, helping it escape notice from predators. Jacanas are carnivores that use their bills to turn over lily pads or other aquatic vegetation. They can also grasp the edges of these plants with their toes to partially turn them over in search of food. Insects, snails, worms, small crabs, fish, mollusks, and seeds are all on the menu. Male jacanas do most of the nest building, using floating plants as a base for a nest made of leaves and stems. After the female has laid a clutch of four eggs, the male takes over the parenting responsibilities. He keeps the eggs dry and warm, not by sitting on them, but sliding the eggs under each wing. If the nest starts to sink, or the eggs are otherwise endangered, the male may pick them up and carry them under his wings to a new site. Meanwhile, the female has left the male, to find more males to breed with. In an unusual role reversal, the female has a harem of males she provides eggs for. She even defends the males from other females while they incubate her eggs. Her territory may be as large as two football fields. Yet she does not participate in raising chicks. If the eggs or chicks guarded by one of her males are lost, she will return to breed and produce a replacement clutch with him. Only one jacana species, the lesser jacana, is known to be monogamous. Jacana eggs are true works of art. They are a deep tan color, with dark markings that look like dribbled lines of paint, crisscrossing the entire egg in an abstract design that is different on each egg. The eggs are glossy and shiny, and look as though they have been highly polished. This wet appearance is nature’s camouflage, helping the eggs resemble the glossy surface of surrounding vegetation. Jacana chicks are fluffy, striped, and precocial. They are able to walk, swim, and dive a few hours after hatch, so the male teaches them how to forage right away. They return to rest under his wings. Chicks stay with the male for their first 40 to 70 days. The father even carries his young chicks under his wings if they are in danger. Even with his attentive care, only about half of all jacana chicks survive to adulthood. Jacanas squeak, cackle, twitter, whistle, and more—they are a noisy bunch! They call to each other if they spot predators, or when looking for a mate or fending off a rival. A father jacana coos to his chicks. The louder the call, the more important it is to the caller! Our first jacanas, Peruvian wattled jacanas, came to us from a zoo in Florida in 1960. Since then, we have also exhibited African and comb-crested jacanas. We do not currently have jacanas on exhibit at the Zoo. Most jacana populations are stable at this time, although the demise of wetlands through agriculture and livestock grazing threatens populations in some areas. The Madagascar jacana Actophilornis albinucha is listed as Near Threatened by the International Union for Conservation of Nature. This species is losing its aquatic areas due to overfishing and rice cultivation. And, like all water birds in Madagascar, it is hunted by humans for its meat. Female jacanas can be almost twice as large as males. 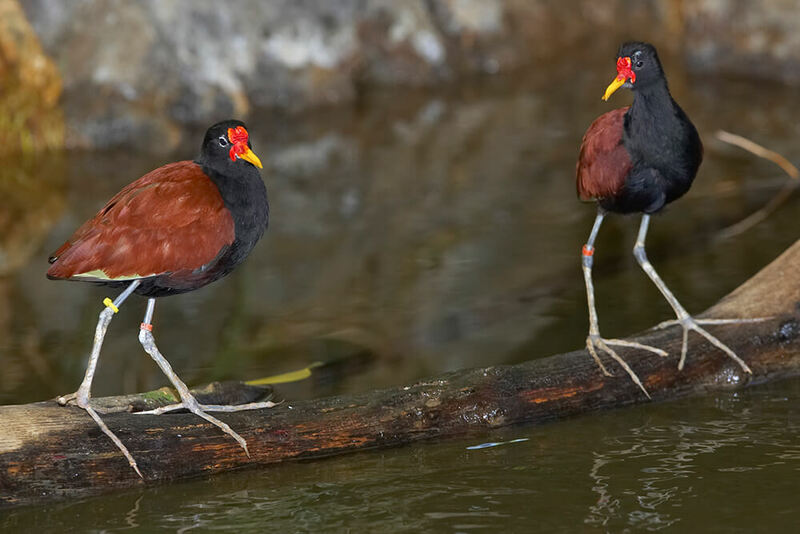 When spread out, a jacana’s toes and claws can cover an area up to 5 by 8 inches (12 by 20 centimeters). Pheasant-tailed and northern jacana males pick up the empty shell of their newly hatched chick and fly several yards (meters) away before dropping it. This may keep predators away from the nest. 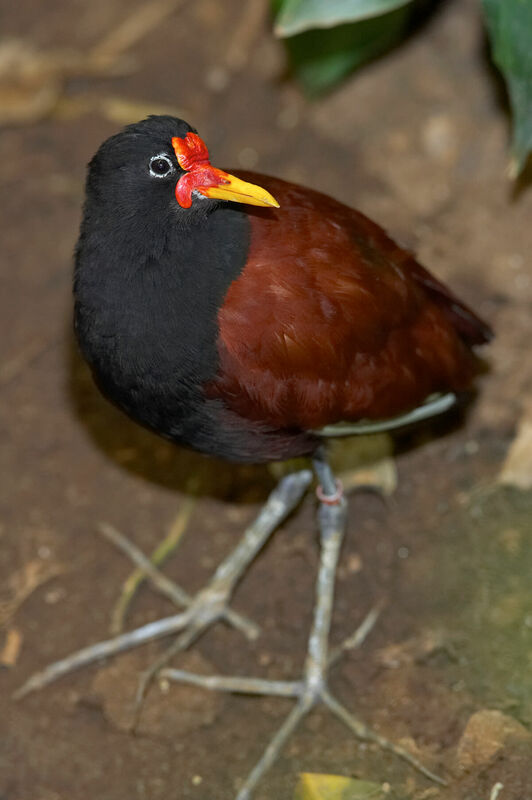 Other names for the jacana include lily-trotter, lotus bird, and Jesus Christ bird.